George SUMNER was born in the Perth suburb of Victoria Park and spent his boyhood days in the immediate area. George was the youngest (by a long period of time) of six children. He had three brothers and two sisters (all of whom have predeceased him) and as the older brothers were finished with various toys (i.e. Meccano and Dinky toys) they were passed on to George. His interest in railways and model trains came at an early age. He got his first train set in 1943. It was a Hornby Dublo three rail set which his parents had picked up second hand, as new train sets were not readily available during the War. In 1948, he discovered the newly opened Stanbridge’s Hobby shop at 5 Great Eastern Highway, Victoria Park and with nose pressed against the window, he drooled over the Hornby trains there. 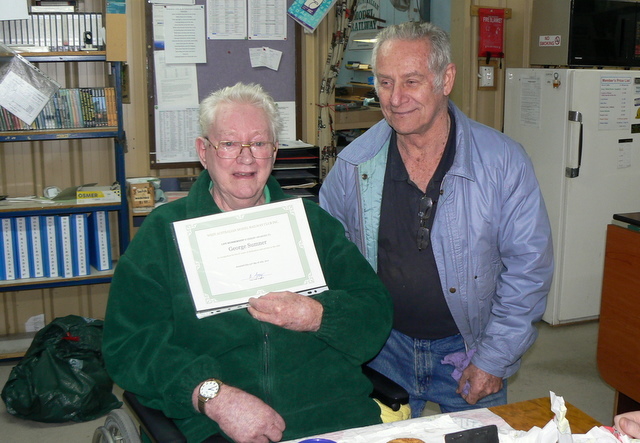 George and shop owner Jack Stanbridge met and developed a life‐long friendship. His interest in full size railways came in part as a young boy from outings to Perth city with his mother. Lunch on these days out was almost always at Boan’s cafeteria on the top floor of the store, where George made sure they sat at a window table overlooking the railway station. In 1949, George joined the RAAF Air Cadets and his interest in planes led to a short career path in that direction. After completion of secondary school, George was taken on as an Apprentice Plumber with the Perth plumbing company S. W. Hart, which he completed in 1958. His interest in the RAAF through the Air Cadets saw him sign on full time in the Air Force in 1958 as an Aircraft Metal Worker, commencing at the Laverton base in Victoria. Also in 1958, George married Merl and during their short marriage they had two children — Mark and Sandra. During his Air Force career, George was based at several of the RAAF bases around the country. In 1963 while based at RAAF Pearce in Perth, he became a member of the newly formed Castledare Miniature Railway for a short period until he transferred to a RAAF base in another State. He left the RAAF in 1964. In the late 1960s, George in his capacity as a Plumber, “went north” to make his fortune in the construction of mining towns in the Pilbara. He worked through the 1970’s in the north, but the fortune didn’t come his way. 1977 was a big year for George with his second marriage to Jan and then in 1980 the opening of his hobby shop “George Sumner’s World of Trains” in Charles Street, North Perth. The hobby shop traded between 1980 and 1983. After the hobby shop, he worked for a steel company for a period before reverting to his plumbing trade running his own business called Beckenham Plumbing until 2007. George and Jan had one son — Michael. In the 1990s George became involved with the Kenwick Junior Football Club when son Michael played for several seasons with them. George’s interest in WA football had stemmed back to his younger days when he was a keen West Perth supporter, so keen that he had painted all his tools of the trade in the red and blue colours of the Club. Some of these tools, still red and blue, are with his son Mark to this day. He had open heart surgery in February 1999 and also worked as a part time Sales Assistant at the Perth Hobby Centre for a period of about seven years from the late 1990s. George joined our Club in 1983 and this was where I got to know him better, even though I had known him through the hobby shop. He served the Club as President for two years, was Treasurer for seven years and also served a number of years on the Committee. During the Club’s time at the Showgrounds we opened to the Public during the Perth Royal Show each year. George prepared the roster for the Royal Show (12 hour days and three shifts each day) for a number of years — not an easy job. At meal times the Club gave the members on duty for a double shift $5.00 towards buying their lunch or evening meal. George noticed that some members would go off to have their half hour meal break and return to duty say, two hours later after looking around the Show. He suggested that we have a “sausage sizzle” for the lunch and evening meals. This idea was put into practice and George supplied the gas BBQ, procured all the food (buns, sausages, onions, sauces and paper plates) and members had their meal at the Clubroom. The $5.00 meal subsidy ceased and the long meal breaks were brought under control! After the move from the Showgrounds, the Club’s future looked grim until the move into the Railway Museum in 2001. George spent many hours at the Clubroom site while the building was being erected and documented the construction with his video camera. He was made a “Life Member” of the Club in 2011. George had a number of home layouts. In almost every place that he lived in, a layout was built and all these were nicely sceniced and he has always been willing to share his knowledge of all aspects of the hobby. Over the years George had nicknames for various people and I for some unknown reason was called “Fatty Finn”, (my daughter was “legs” and another acquaintance was “the randy little toad”). These names were never forgotten by George. Well, after a number of years of being “Fatty” or “Fatty Finn”, revenge came by the name of one of the Thomas the Tank Engine characters — George the road roller. The promotional material for the Thomas range of items said that “George is a grumpy fellow”. Well, there it was “Grumpy George” which I started calling him and George was “Grumpy George” ever since. He accepted the name so well, that even his Club polo shirt showed his name as “Grumpy George”. In latter years two ladies that he met were nicknamed “undies” and “the old grey mare” for reasons only known to George. His family too saw the humorous side of George when on one occasion at an extended family gathering he claimed that he could walk on water. When he was “in the water” with younger family members looking disappointed that he in fact hadn’t performed the miracle of “walked on water”, George admitted to all that “maybe he needed a bit more practice”. George had a long association with the Whistlestop Miniature Railway at Busselton. He had known Allan and Christine Sunderland long before they decided to open the railway themed park. He helped behind the scenes and referred to the times he spent at the Whistlestop as some of the most memorable of his life. A story about Allan and “dud” baked beans came to be after a three day visit to the Whistlestop by George and myself and right up till the end, George enjoyed telling this story, usually accompanied by dribble as he laughed so much when telling it. George’s life took a turn for the worse on 20th January 2007 when he suffered a stroke. He was confined to a wheelchair ever since and virtually dependant on help for all of the everyday things that the rest of us take for granted. Many people would have dropped their bundle, lost interest in life and living, but not George. His sometimes (well most times) “wicked” sense of humour helped keep him going. A regular group of friends would visit him at home and in his latter days his pets dog “BRONSON” and cat “CHURCHILL” were of great comfort to him. A very old Bronson died in August 2017. George turned 80 on 4th October 2017 and had told his family that he didn’t want to do anything on the day. In liaison with the Club, a surprise sausage sizzle birthday party was arranged for him at the Clubroom. He was picked up to go to Club on the normal club evening and was none the wiser until he got there. He said that the evening was something that he would remember for the rest of his days as even his great‐grand kids were there to enjoy the occasion in surroundings that has had such a special place in George’s life. In November 2017, George was again hospitalised for close to three weeks with a bowel infection and when discharged he vowed that he didn’t ever want to go anywhere near a hospital again. Things didn’t work out that way though. On Saturday 6th January 2018 when George was having his morning shower, his usual practice of turning the water off when he was finished went very badly wrong when he turned the cold water off first. As he sat on a chair for showering and could not easily move, he was severely burnt by the hot water and was taken to the burns unit at Fiona Stanley Hospital. Hospital burns unit staff and the family had a meeting on 10th January and it was agreed that George was to stay in the burns unit for the remainder of his life which was expected to be up to 14 days. George defied the odds and lasted 20 days even though he was in much discomfort. I’m not sure where George has gone in the “after life”. He often said that he didn’t want to go “upstairs” because he wouldn’t know anybody!!!!! Wherever, you have gone George, I’m sure your sense of humour will be appreciated. The attendance at George’s funeral on 9th February 2018, far exceeded the capacity of the Chapel at the funeral parlour and the adjoining lounge area was opened for the overflow of mourners. Our club was well represented with a number of members wearing our green club polo shirts standing them out in the crowd, a point that did not go unnoticed by George’s family.